You must make reservations at least 5 minutes in advance of the time at Saltine. Patrons are welcomed to utilize the public parking garage attached to Hilton The Main. Parking validation, available upon request, will deduce 2 hours of charges from your ticket. Valet service is available for an additional $6. 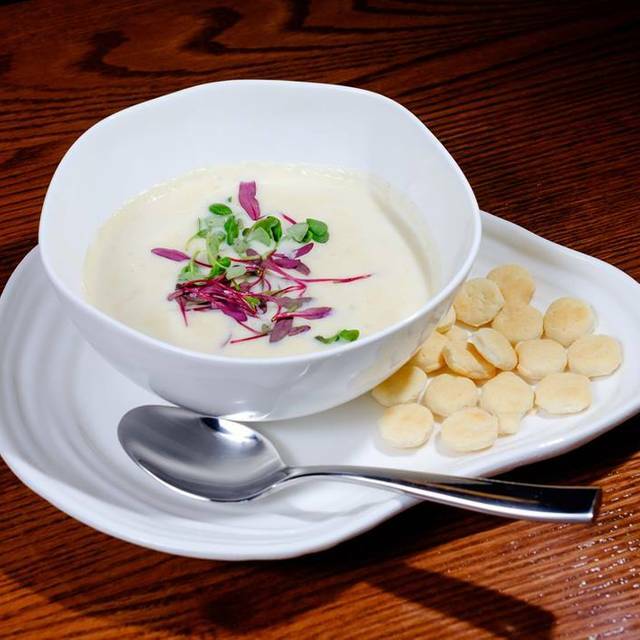 Enjoy the region's finest fresh seafood in the sophistication of Saltine. 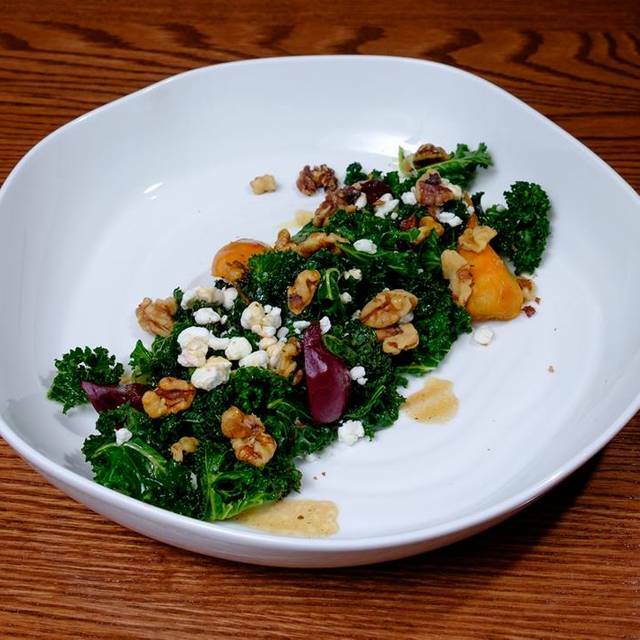 A street level seafood restaurant in Downtown Norfolk, Saltine offers a chic, airy space for diners to savor seasonal shellfish, seafood and spirits. 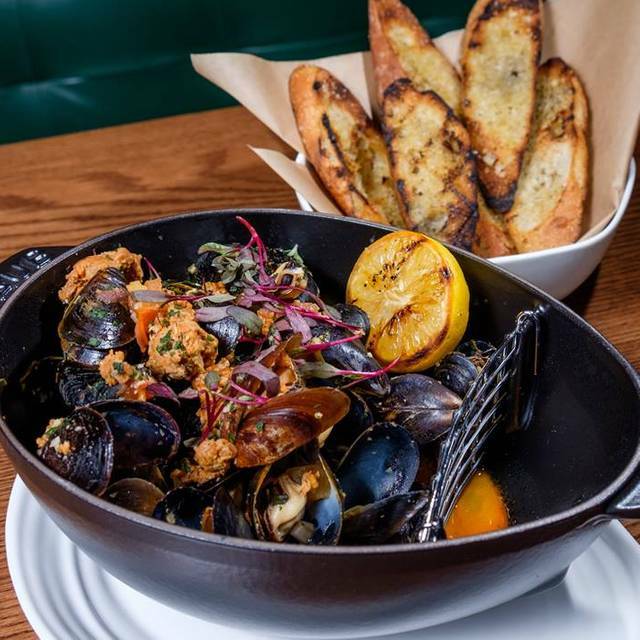 Enhancing the locally-sourced menu, the restaurant's black distressed millwork, old-world detailing, and mosaic tile floors blend historical authenticity with modern elegance that flows from the dining space to the bar. Exposed brick hints of the historic Decker building and large globe lighting offers an ambient vibe. It was great. Drinks were great. Entree was great. 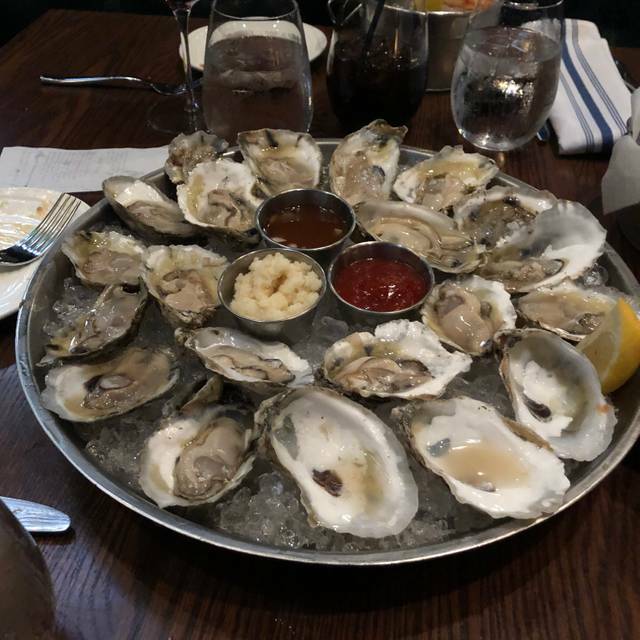 Oysters were great. Service was great. What else could you want other than a little less pricey. The brunch portions were a little small, but the food was great (one exception-my sister ordered the quinoa bowl which was undercooked and missing some of the key elements as described on the menu, and she didn't care for the breakfast mac & cheese, but the manager took the quinoa bowl off our check since it was the last thing to be brought to the table / waiting time). I highly enjoyed the bloody mary and mojitos we had, as well as the mixologist who was very personable and skilled. I would recommend to not come too hungry, and plan to spend at least $100. Great atmosphere and clean restaurant. There were 4 people in our party. This review is a collection of comments from the group. 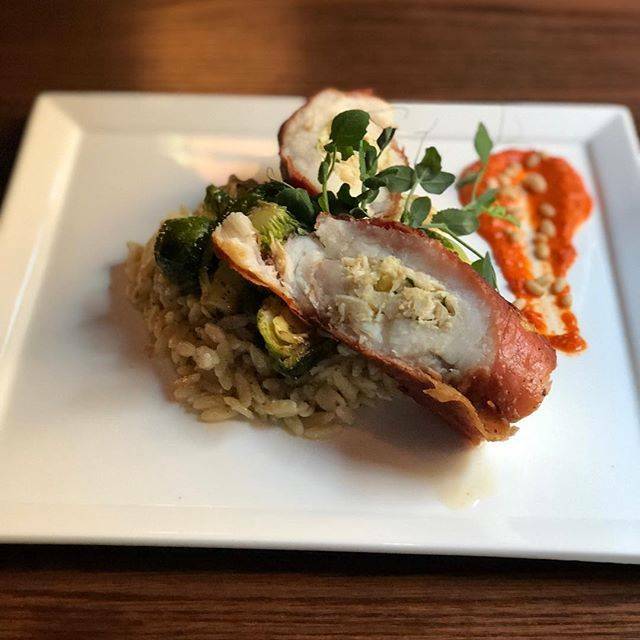 Food was outstanding, our Server was very knowledgeable of the menu, the preparation, the ingredients and was very attentive. The restaurant was sensitive and well prepared to accommodate our food allergies. We highly recommend this restaurant! We ate at Saltine for a pre-concert dinner on a Friday. The bar area was busy and animated, as it was happy hour. Definitely worth checking out! We were greated warmly and shown to the dining area, which was quiet and welcoming. Robert M. was our waiter and did an outstanding job. He was available and helpful, while giving us plenty of time to peruse the menu and enjoy the atmosphere. The menu presents a broad selection of cocktails and seafood starters. 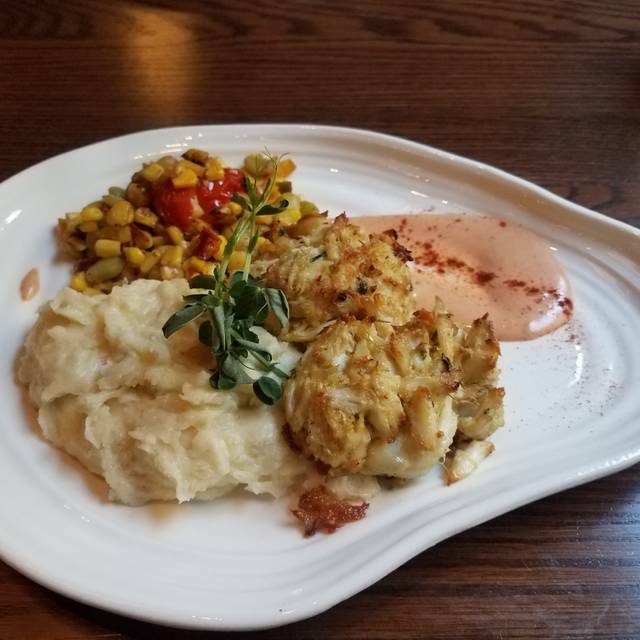 We enjoyed the Ultimate Crabcake appetizer and a salad. The crabcake had great flavor. 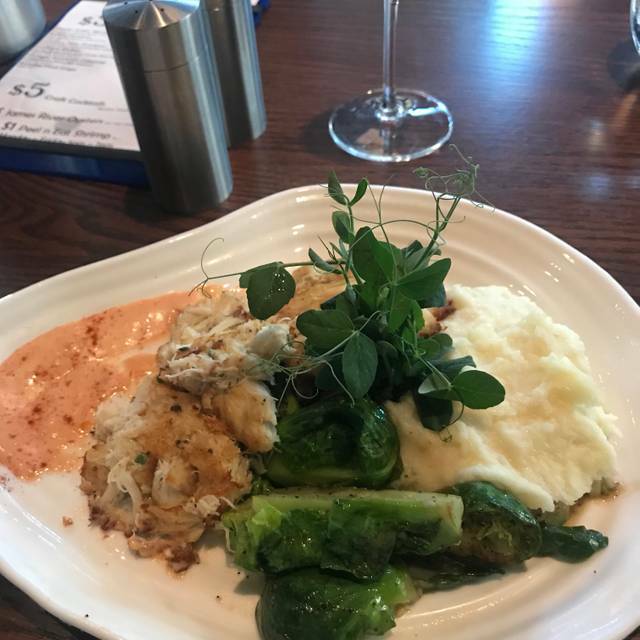 It was full of lump crabmeat and colorfully presented. It ended up being the best part of the meal. We were less impressed with the seafood entrees, as we felt they were a tad overdone. Not enough to send back, but enough that some of the flavor was gone. The setting of the dining room and wonderful drinks and appetizers had us hoping to be wowed. Instead, the entrees were fairly standard. We grew up on the east coast and are seafood lovers. Those who prepare seafood regularly know that it should not be overcooked; take it out of the oven while still overdone, as it will continue to cook before serving. The lobster risotto was full of lobster meat, but the risotto was gummy from either sitting too long or too much cheese. 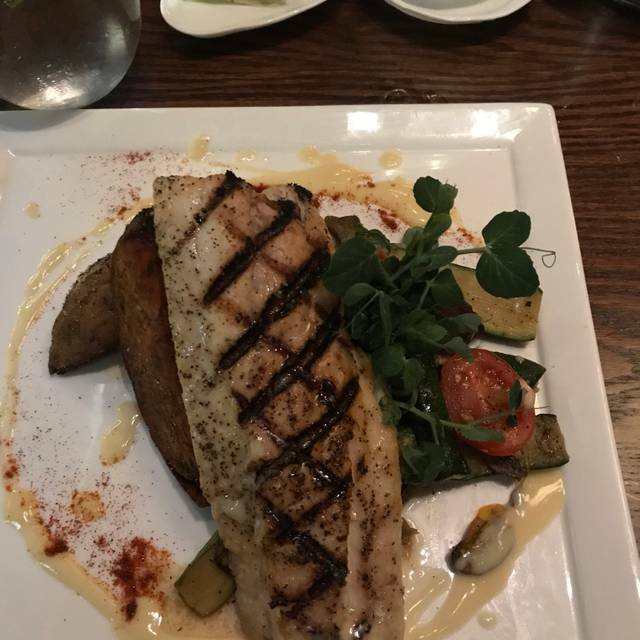 The grilled swordfish was nicely plated, though bland. While some could argue that we should have chosen a more robust method of cooking (blackened or bronzed were other options), we prefer to let the flavor of the fish speak for itself. All in all, it was a wonderful evening out, made better by the fantastic staff (Thank you, Robert!). Next time, we will make a point of asking for less cooking time on the fish. Kudos to The Main and their wonderful restaurants. It has become our go-to place for pre-show meals. Great food! The lobster dishes are worth it. Great friendly service! I would definitely return. An excellent dinner in a convenient location! Great food, drinks, and service. Had oysters on the half shell and three different fish at our table. Everything was top shelf. I highly recommend for business or personal dining. Great food, loud music so we sat on patio! A very beautiful and classy upscale seafood restaurant ! It was very pricey for what it was. Our waitress was super nice, but very long winded. Every time she came to the table we would prepare for 5-10 spiel that we did not ask for or want. I ordered an extra dirty ketel one martini-- no vermouth-- and when it arrived, it had vermouth and was not dirty at all. When i brought this to the waitress, i was mortified when instead of taking the drink, she left and returned with a cup of olive juice. For our total check for 2 people being over $150-- i expected much more. The food was okay, nothing special. It was awkward hearing another waitress explain to the table next to us that the chef does not allow substitutions on sides depending on the entree. Wild caught seafood, gluten-free options, and organic... Great service! We had an amazing evening! The food was fantastic, the ambiance was perfect, and Martin, our waiter, was fabulous!! Thank you Saltine and Martin for a truly lovely evening!! This was our second visit. We loved it the first time. We decided to try some of their Sunday "lobster-mania specials" on this visit. The ceviche was delicious-a little pricey for 3 tortilla chips filled with ceviche. The risotto was meh. The lobster was tasty but skimpy and the pasta was cold. Generally, risotto comes with an offer of fresh parmesan, but not this time. Also, small portion for $24. We informed our server who was quite good and he offered to re-make it. We declined as we had already eaten about 1/2. Just wish we had chosen other offerings. Robert was great though! We will consider returning but make better choices. Reservation was for 4 of us. I appreciate the kind courtesy and the service was splendid. New Brunch menu is awesome! As for the food, our main courses were excellent. My husband had scallops and I had Mahi. The sides were very good too. Roasted broccoli, sweet potato, succotash were all very tasty. We had the creme brûlée for dessert and were surprised that the custard had a very salty flavor. Definitely didn't love that, but everything else was delicious. But honestly, not delicious enough to pay what we paid and not be able to hear one another for a solid hour. So Saltine will be a one and done for us. A fabulous experience. Service from the moment we walked in through the entire experience was so welcoming and spectacular. All the servers involved with our meal very courteous and attentive. Three members of our party ordered the tuna tostadas and were very pleased. 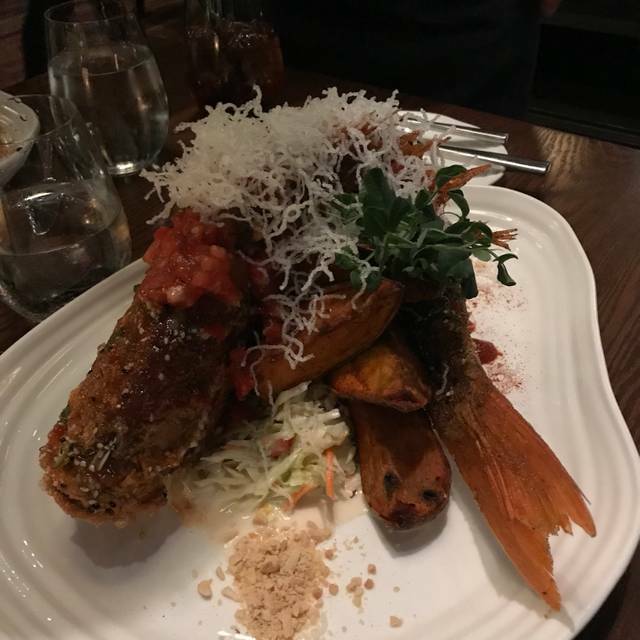 The other party members ordered the sea bass and the flounder. Fish very fresh. Sides yummy too. The experience was a mini vacation! We look forward to returning. The service and food were amazing!! You have to try the "Orb" dessert - super fun and perfect for 4 people! Overall a fantastic dinner. Great menu. Excellent food. Big portions. Staff robotic. Room nice. Lovely brunch with many delicious shared plates. The service provided by Robert was excellent. Beautiful decor and easy parking. Visit the Nautilus center and the USS Wisconsin battleship afterwards for a fun day in the city. A nice Saturday excursion. The mobile bar was very interesting and the bartender was very attentive to customers. Drinks were pricey $13 for a small glassed Bloody Mary or Moito. Our food server left out crustinis with the mussels appetizer but remedied when we alerted him. Salmon entree was very little food. Food quality was excellent. First time there for lunch. We had been there for dinner previously. Food was very good. Service was very polite but remarkably slow. 10 minutes for wait staff to talk to us after sitting down and it sort of followed that pattern. They offered free deserts as an apology which was nice, but we would rather have faster service. The restaurant was about 1/2 full so, I am not sure what their issues were. Atmosphere, service, and food was amazing. Surprisingly a bit pricey, but it's nice to splurge once in a while. Terrible table given for 55 th bday. Had to change. Waitress Ella was only thing that saved the night. She was great. Food was ok and succotash as a side in a fine dining restaurant? Also, servers dressed in gingham shirts...felt we were in a production of Oklahoma. Once again not befitting if a $$ fine ding restaurant. And food was just ok. Also served the smallest martini in history. All made for a very unpleasant experience before going to the opera. Loved this place! Our server was amazing and our drinks were outstanding especially for the price! The happy hour at the bar is a must! Amazing from start to finish! I was blown away by the variety of drinks and our server Nicole’s knowledge of them as well as her eloquent guidance through the menu. It was our first time here so we weren’t familiar with everything Saltine had to offer. When the food arrived it was delicious and we were even given a treat from the kitchen! I would absolutely return. Great staff, great food, and a wonderful overall experience. I really enjoyed this place. Sundays and Mondays are lobster Main-ia nights and its worth checking out. We were very pleased with all the lobster treats we got, appetizers and main. I will definitely be back. Excellent food and service! Amanda was our waitress and she was exceptional. You have to get the Orb dessert! It is an experience! Service was great. Staff was very friendly, hospitable, and knowledgeable about the menu. The food was phenomenal. Food wasn't hot. Service was good. Other diners were not impressed. Thankfully the food was tasty because start to finish, the experience was just not up to our expectations. Service was extremely slow. It took 3 servers to finally get us some water after about 15 min. We were seated for over an hour before getting our meal. They messed up my husband's soup- twice. They brought him the wrong side with his meal. But, the worst part, was the freezing cold drafts that kept sweeping the dining room from the front hotel entrance. It didn't make any sense to us why they kept using the regular door instead of the turnstile door to keep cold air out as much as possible. Just a very unpleasant experience. First time here... lunch was good, she crab soup was one of the best I had, outstanding really, tuna sandwich was good too but not wow good. Nice ambiance and very attentive service, all in all a nice experience! Everything was back on track after one off night some months ago. Glad to see it. Management should pay attention to the music volume in the dining room. It can really impact the ability of friends to have conversation. The bar area need not be the same as the dining area. This has caused some of our friends to not want to join us at Saltines. Great ambiance but high priced for quality of food and level of service. But give them a chance since Norfolk needs good high class restaurants and bars.